Mining subsidence affects many parts of the UK and often many years after the mining operations have ceased. This project has involved photographing approximately 20ha using a UAV from which accurate height data has been established. To undertake the work the site was split up into a number of smaller areas and each area was flown twice at different orientations. The captured imagery was then processed to create one seamless aerial image (orthomosaic) which is made up of over 1200 images and 12Gb of data. For this processing Drone Deploy was used, cloud based software for managing UAV derived data. The image shown here is an extract from the survey. 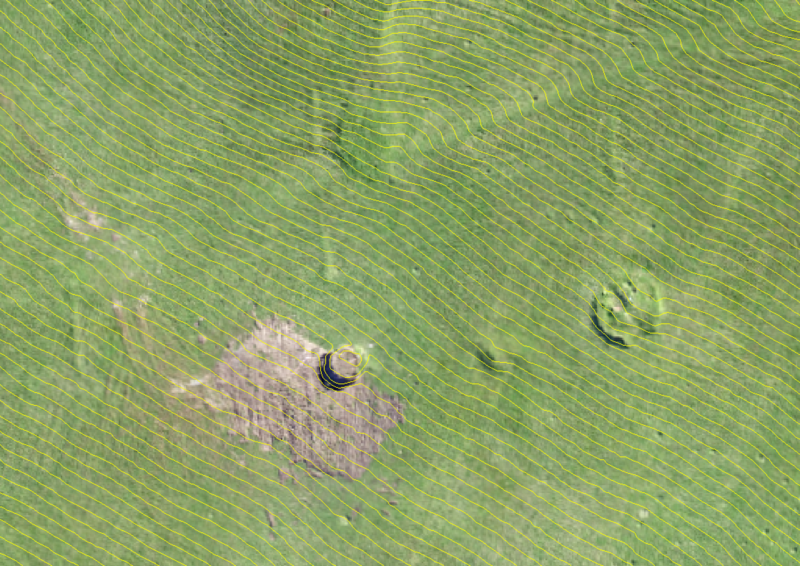 It shows a grass field shown in high resolution with the pixel size being 3.5cm which is very detailed when compared with, for example, Google. On top of the picture are contour lines created from the imagery and height data and these are at 250mm intervals. From these two data sets there are clear depressions on the surface and the site will be flown again in another 3 months time to see if any movement can be detected. To achieve the required accuracy ground control points were used as this allows the x/y/z position to be calculated to about 30mm. Drone Deploy is used as they have substantial computing power to process large data sets. In addition the resulting imagery, elevation data and 3D models can be viewed by clients "on line". Otherwise it would require the purchase additional software and not least make available to the client some very large data sets.